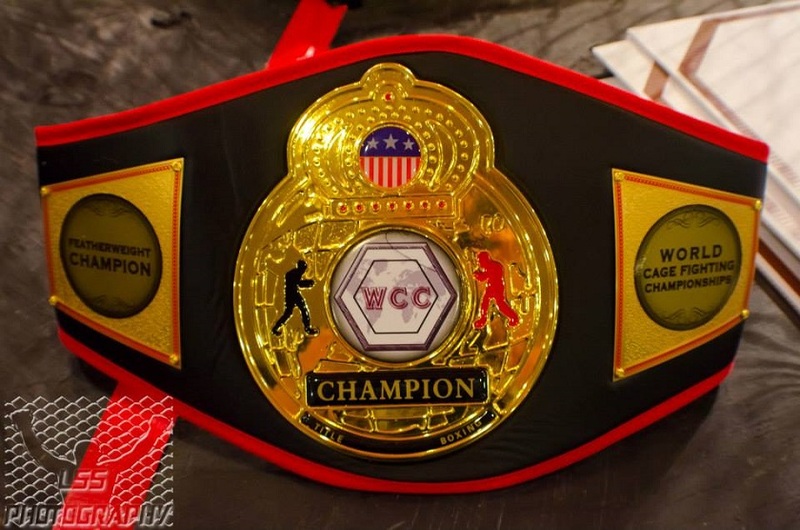 World Cagefighting Champions (WCC) X was held at the Econo Lodge Event Center in Allentown, Pennsylvania, Nov. 8. In the main event dangerous striker Rex Harris defeated Tony Parker when the Ohio native tapped out due to strikes at 3:37 in the very first round. WCC President Doug Yasinsky said it was extremely difficult finding Harris a suitable opponent after T-Rex literally stopped his previous opponent Lamont Lister in his tracks with a series of hammer fists at WCC IX earlier this year. Lister remained still on the canvas for several minutes before being carried out on a stretcher. Yasinsky said 11 opponents turned down a matchup with Harris before Parker stepped up. In the co-main event Desmond ‘M-80’ Moore who trains out of American Top Team Hammer proved why he is the best 125-pounder in the Lehigh Valley after he stopped Mike Heffelfinger at 2:28 in the first round. Referee Bill Bookwalter called an end to the contest after Heffelfinger failed to defend himself from a series of explosive strikes delivered at the hands of M-80. In the night’s first pro fight, Sharif ‘Bam Bam’ Jones submitted Dante Rivera BJJ student, Greg Quarantello of Freehold, N.J. at 4:31 of Round 1 via rear-naked choke. In exciting amateur featherweight title fight, John Brennan would score a unanimous decision victory over a very tough, Wally Hess. Brian Knarr earned the MyMMANews.com Submission of the Night with his technical submission win over Sean Behm. Referee Bill Bookwalter would call the fight after Knarr cranked in a very tight Kimura that would have eventually snapped Behm’s arm. Behm seemed displeased with the call and rightfully so being in the losing position, however, Bookwalter saved his arm and month’s of rehabilitation as there was no question the bone would have given out. WCC XI will be held next Saturday, Nov. 15 at the Sherman Theater in Stroudsburg, Pennsylvania.